Action verbs, also called dynamic verbs, express an action whether it be physical or mental. An action verb explains what the subject of the sentence is doing or has done. Looking at action verb examples helps make it clear the function of action verbs in sentences and what purpose they serve. There are endless action verbs used in the English language. An action verb can express something that a person, animal or even object can do. To determine if a word is an action verb, look at the sentence and ask yourself if the word shows something someone can do or something someone can be or feel. If it is something they can do, then it is an action verb (if it is something they can be or feel, it is a non-action, or stative, verb). 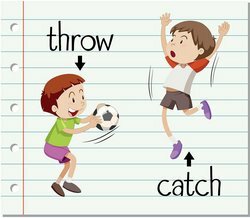 The following are examples of how action verbs are used in sentences, keep in mind that you can use more than one action verb in a sentence. The action verb is in bold in each sentence. Remember that action verbs don't have to describe movement; the action can be mental. Anthony is throwing the football. He thought about his stupid mistake in the test. John visited his friend for a while and then went home. She left in a hurry. She yelled when she hit her toe. I'll play this song on my guitar. He hit a home run at the last game. Will you help me with the laundry? He rode his new bike around the block for hours. The horse trotted along the trail. We ate dinner then walked around the park. Did you fix the mistake in your homework? She waited for her friend at the mall. She lay on the couch and slept there all night. The bird sings a cheery song every morning. The teacher reads a book to her students then asks them questions about the story. Present tense: I eat when I am hungry. Past tense: She ate dinner last night at six. Future tense: We will eat lunch tomorrow at noon. Present tense: We swim when it is hot outside. Past tense: Last week, we swam in the pool. Future tense: We will be swimming at the lake next month. Present tense: The baby sleeps in the nursery. Past tense: She slept all night. Future tense: We will be sleeping in tents at summer camp. Present tense: The kids play basketball at recess. Past tense: We played the last game on Monday. Future tense: The girls will be playing at the park this weekend. Action verbs are used to deliver important information in a sentence and add impact and purpose. These verbs play a vital role in grammar and signals to the reader what action the subject is performing in the sentence. We also have more information on the function and types of action verbs. And once you're fully familiar with action verbs you can practice further with YourDictionary's action verb worksheets. "Action Verb Examples." YourDictionary, n.d. Web. 23 April 2019. <https://examples.yourdictionary.com/action-verb-examples.html>.